The energy our body needs for processes such as digestion, locomotion, heartbeat and thought is provided from a dietary source, such as glucose, and from oxygen. Glucose and other nutrients find their way around the body in the plasma, while oxygen is carried within red blood cells. Anaemia is caused by the inability of haemoglobin and/or red blood cells to provide enough oxygen to the tissues, resulting in loss of energy. The consequences of this insufficient oxygen (hypoxia) are a group of common signs and symptoms, outlined in Table 1, and are often used to diagnose anaemia. Unfortunately, many of these are present in a host of other conditions, such as lung disease, and so to truly define anaemia a blood test is required. The mean cell volume (a measure of the size of the red cell). 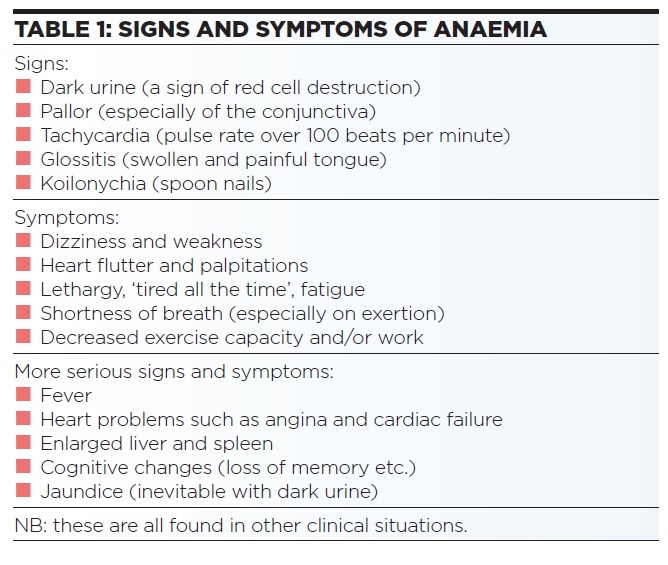 A diagnosis of anaemia is made if the subject is symptomatic (as in table 1) and has abnormalities in their red blood cells – typically a low haemoglobin and/or a low red cell count. 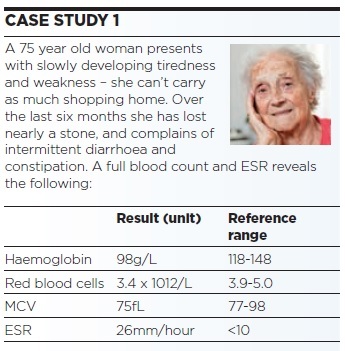 An allied test is the erythrocyte sedimentation rate (ESR), which is abnormal in anaemia, but is also abnormal in many other diseases such as cancer and inflammatory disease such as arthritis, and so is not specific for anaemia. Loss through an acute or chronic bleed (that is, haemorrhage), such as after surgery, due to over-use of anticoagulants, or from a ruptured blood vessel or ulcer that may leak into the intestines nnA haemoglobinopathy, the most common being sickle cell disease and thalassaemia. To further investigate the cause of the anaemia, knowledge of the mean cell volume (MCV) is essential. When the MCV is large, the cell is said to be macrocytic, and there is macrocytic anemia. Causes of this type of anaemia include lack of vitamin B12, alcoholism, liver disease and pregnancy. Figure 1 summarises this process. 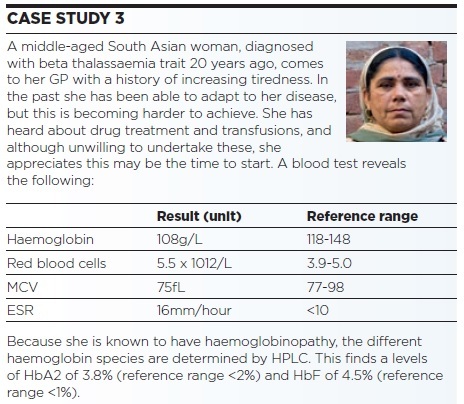 For complete proof of the causes of microcytic and macrocytic anaemia, additional tests are required. These will be ‘iron studies’ and serum vitamin B12 and folate respectively. Once a diagnosis of anaemia has been made (according to the presence of symptoms and abnormal red cell indices), the cause (such as a malignancy) must be determined, and, if possible, treated. 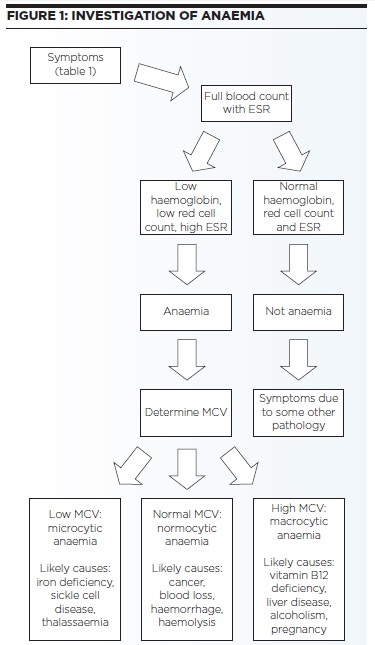 The MCV, followed by other blood tests, narrows down the potential causes of the anaemia, and so can direct treatment. For example, if the iron studies indicate a lack of this micronutrient, it may be supplemented orally or by parenteral routes. Macrocytic anaemia, due to lack of vitamin B12 or folate, can be treated with injected or oral supplements respectively. As the spleen is one of the sites of the removal of abnormal red cells, splenectomy is often used to help treat haemolytic anaemia as it may be found in autoimmune haemolytic anaemic, sickle cell disease and thalassaemia. However, this surgical option would be considered after other treatments have been shown to be inadequate. Those whose anaemia is a consequence of chronic kidney disease may benefit from injection of the hormone erythropoietin. In the most severe and life-threatening situations, blood transfusion may be the only option. 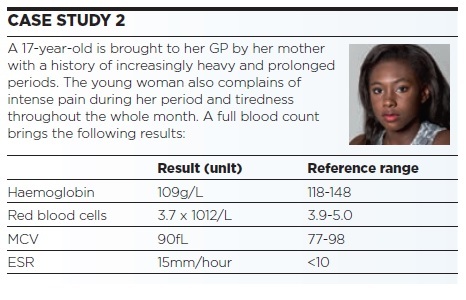 From the haematologist’s perspective, menorrhagia exceeding 80ml of blood per cycle (although difficult to measure) can lead to a normocytic anaemia. However, if prolonged, iron stores become depleted, then the anaemia will become microcytic. Consequently, iron studies are essential, especially if the bleeding has been prolonged, and supplements may be necessary. But, of course, it is preferable to determine and treat the blood loss itself. Globally, this is the most common form of anaemia, and is inevitably microcytic. It can only be diagnosed with other blood tests such as serum iron and ferritin. In the developed world the most likely cause is malabsorption, caused by diseases of the stomach and intestines. Abnormal absorption of iron (and other foodstuffs) is often the consequence of cancer, ulcers, and inflammation of these organs, examples of the latter including chronic gastritis and inflammatory bowel diseases such as Crohn’s disease and coeliac disease. Women are more likely than men to suffer inflammatory and auto-immune diseases such as rheumatoid arthritis and lupus. These can lead to the development of ‘the anaemia of chronic diseases’ (ACD). A common treatment is oral ferrous sulfate tablets, to be given as long as the symptoms of anaemia and abnormal laboratory results persist. However, this may need to be even longer if iron stores in the liver and elsewhere need to be replenished. Dependent on the degree to which iron stores have been depleted, this is likely to be at least six months. An alternative, which gets round the malabsorption problem, is slow subcutaneous injection or intravenous infusion. Although the response to parenteral iron is often no quicker than by the oral route, stores in the liver and elsewhere are likely replenished more rapidly. Side effects include hypersensitivity, nausea and vomiting. New treatments are emerging, including ferric carboxymaltose, which is administered as an injection/infuion and can be used when tablets are ineffective. Normally-menstruating women need more iron than men and post-menopausal women, but this requirement for 1-2mg daily should be increased to 1.5-3mg daily if pregnant. This is because her baby will demand 300mg of iron, and other changes (uterus, red cells, placenta) another 600mg. Anaemia may be a problem because, although the pregnant woman increases her red cell mass by about a quarter, this is exceeded by an increase of a third or more in her blood volume. If the haemoglobin is as low as 100 g/L, then there may be an additional cause, and a low MCV should be investigated as the size of the red cells should stay the same or increase, not get smaller. It is also important that pregnant women have plenty of folate, as babies need this essential micronutrient for the development of the spinal cord and central nervous system. Insufficient folate causes spina bifida, aneucephaly and neural tube defects. The pregnant woman also needs folate for her own red blood cell development. Accordingly, in the UK, NICE recommends 400 micrograms daily before pregnancy and throughout the first trimester, even if the woman is already eating foods fortified with folic acid or rich in folate. However, this should be 5mg daily throughout the pregnancy if there has been a previous neural tube defect. The blood result and symptoms point to a normocytic anaemia, the cause very likely being the blood loss from heavy periods. Iron studies are generally not called for at this stage, and treatment focuses on reducing the blood loss. A referral to a gynaecologist may be needed, although common treatments for ‘teenage’ menorrhagia include the oral contraceptive pill and tranexamic acid. Once the pathology has been addressed, the red cell indices should return to the reference range. for the mutated and so dysfunctional beta globin molecule. not to try a transfusion. place of other inducers of HbF, although some are in development. tiredness could be due to other factors. Routine blood tests explained (3rd Edition). AD Blann, M&K Updates, 2014.